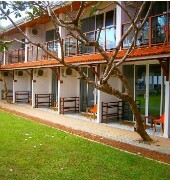 Calamander Unawatuna Beach Resort is a four-star hotel placed on the bay of Unawatuna. 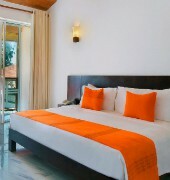 The resort is approximately 7km away from Galle and an hour’s drive from Colombo. Accommodations have an access to the balcony and fitted with individually controlled air conditioning, ceiling fan, IDD telephone, flat screen TV with satellite channels, mini bar and laptop sized safe. Private bathrooms have shower, hair dryer and complimentary toiletries. 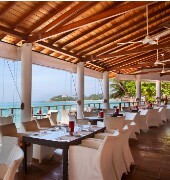 The restaurant on-site serves both international and local cuisines. 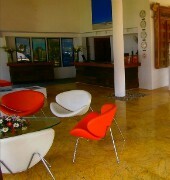 Guests can also enjoy the light meals and a refreshing drink offered at the coffee shop and bar. 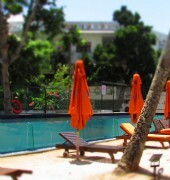 Leisure facilities and services include a complimentary Wi-Fi in public areas, table tennis, outdoor swimming pool, beach volleyball court, aqua gym, yoga classes, massage services and a padi diving club (available according to the weather conditions). Airport transfers and city tours can also be arranged at the front desk.